Just before Christmas 2005, I was diagnosed with acute lymphoblastic leukaemia (ALL). Over the next two years, I spent time in and out of hospital receiving treatment for cancer. Finally, in March 2013 I was given the all clear and told leukaemia had gone away. I still visit Great Ormond Street Hospital for check-ups where I always pop into the playroom – still my favourite place – to say hello. Today I am a very busy girl. I love being a brownie, riding my bike, swimming, acting and dancing. But I especially love playing with my friends. 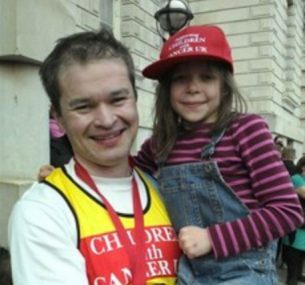 This is me with my Uncle Kieran who took part in the London Marathon in 2013 and raised an amazing £30,000 for Children with Cancer UK. Thank you to all those who generously donated. Both my parents have run the marathon in 2008, 2010 and 2012. Donations have so far totalled £50,000! 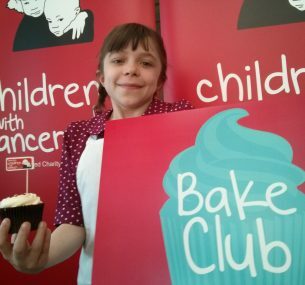 Since being the face of Bake Club for Children with Cancer UK in May 2014, I have been super busy. I’m now at secondary school where I have a passion for English and Drama. Out of school, amongst my many activities I’m an active scout. 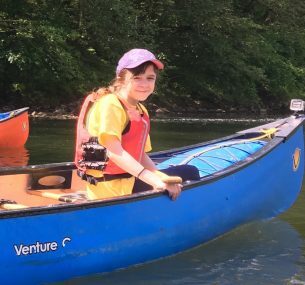 In the last year alone I have taken part in a 12 mile night hike (finishing at 5.30am in the morning), I have helped organise a high ropes camp, I was in charge of the food and canoed 18 miles in the Wye Valley in Monmouth. My mum says I’m the busiest person she knows. I still make time to go for my yearly check-ups at Great Ormond Street Hospital, here I see some familiar faces and I am always reminded of how far I have come.